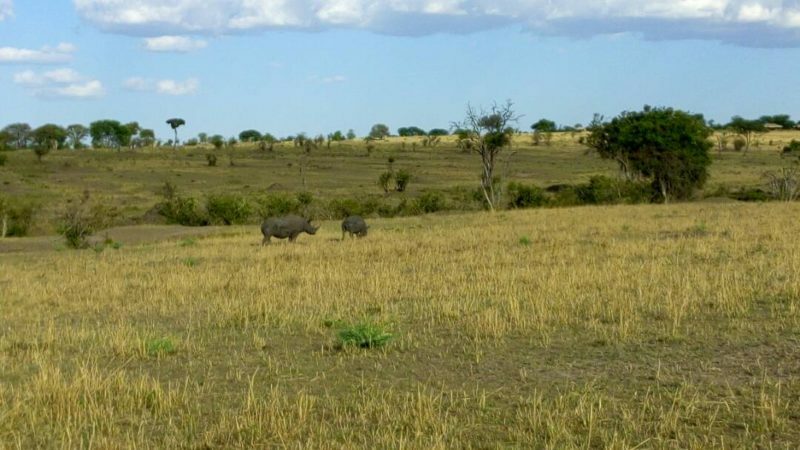 Planning your safari to Tarangire National Park? 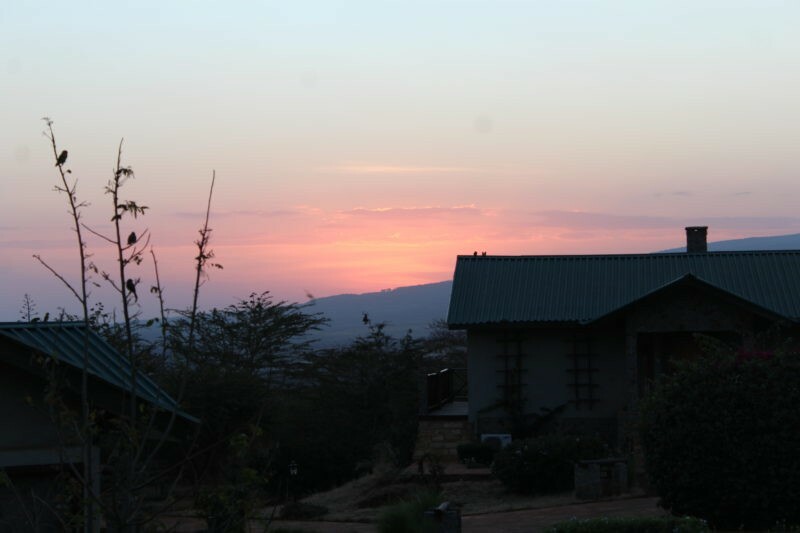 We've compiled this guide to help you decide where to stay in Tarangire. 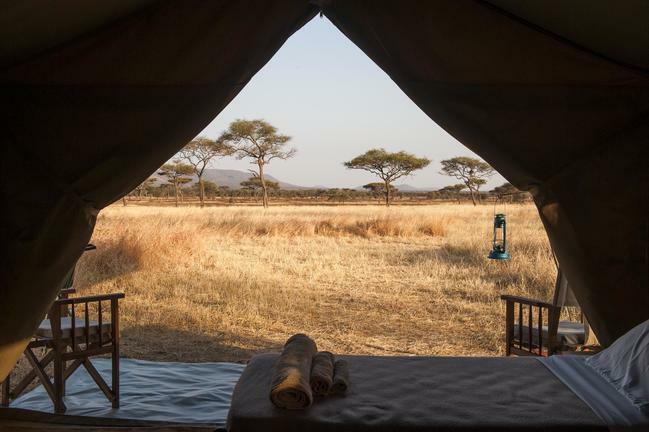 From rustic tented camps to luxury lodges, there's something for all budgets. A ten day safari multi country safari that became an adventure of a lifetime. 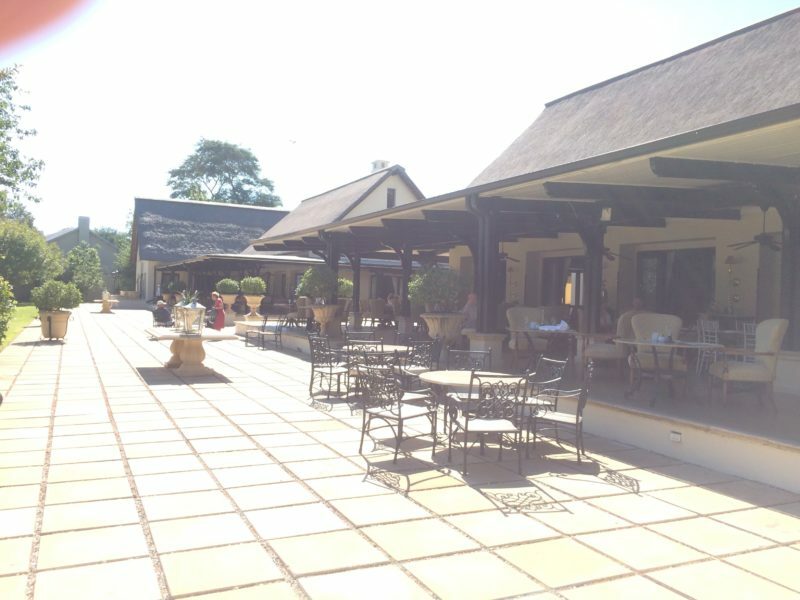 Our client arrived in Arusha excited to go on a journey through the African bush. Her safari would take her into the depths of Tanzania and Uganda, finding animals that are awed among all others. 10 days and 6 parks was her itinerary for her epic adventure. Many of us including myself are jealous of this tailor made itinerary. Her first stop was Tarangire National Park. Here she stayed in Sangaiwe Tented Lodge it is has a beautiful view from the room balcony, after the drive and game drive through the park it was a great place to relax and see wildlife still. In the morning after breakfast, she had another game drive through the park seeing various animals and particularly having a few special moments watching elephants by the river. Exiting the park the went into the Ngorongoro region and spent the night at Country Lodge in Karatu. This is just a stopover before carrying on in the morning in the Serengeti where she headed to the central part to catch the plethora of animals there this time of year. This trek between parks is known for its “serengeti massage”, a term coined because of the continuous corregations on the dirt roads. Lomayani, our driver made this trek as pleasant as possible with colourful conversation and information to keep her happy. Once in the park, she had sightings of leopard, lion, buffalo and rhino allowing her to check of seeing the ‘Big Five’. On the game drives that day and the next two in the Serengeti she had the ability to the wildebeest migration in the Central Serengeti. Tanzania is wildly known for this great migration of animals moving in a southern to northern pattern and back again depending on the season and time of year. This specific time of year the main herd of the migration was in Northern Serengeti and Maasai Mara as the rains have hit that region before the southern and central parts. 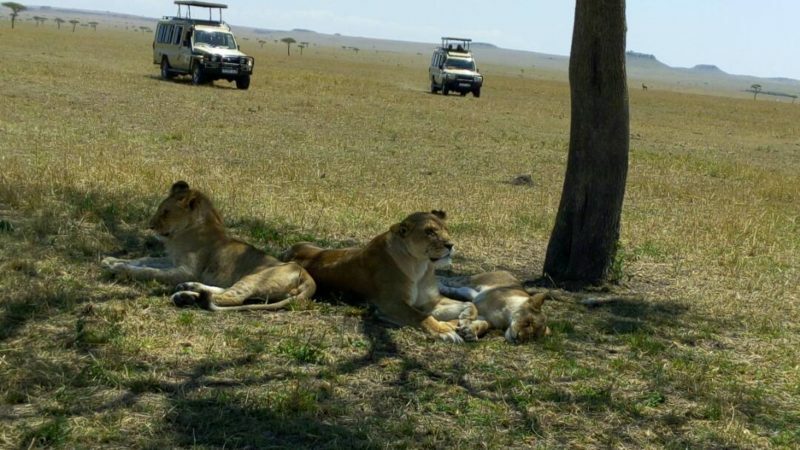 This guest had sightings of the smaller groups of animals, during her entire trip. Her stay and Serengeti Kati Kati camp was amazing they treated well and made her stay exceptional. Leaving the park on the third day she headed for Ngorongoro Crater. Some consider this to be the “The Eight Wonder of the World”. With the help of her driver they spotted. Overnighting at Ngorongoro Wildlife Lodge, she had the perfect view of the crater right in front of her. In the morning, after an early breakfast they headed down into the crater to capture the beauty of this bucket list location. A few factors affect this awe inspiring crater; firstly, the scenery of how this crater has become an animal sanctuary; secondly, the diversity and plethora of wildlife; finally the combination of the previous factors has left people speechless and thankful for such amazing places on Earth. Our guest truly enjoyed herself here seeing the range of animals around. The next day was spent in traveling across to Uganda, where she would have a very different experience on her 10 day African safari. We will dedicate a full blog to her adventures in Uganda with the Gorillas. Send us an email if you want to know more on booking a safari with us and going on an amazing adventure. 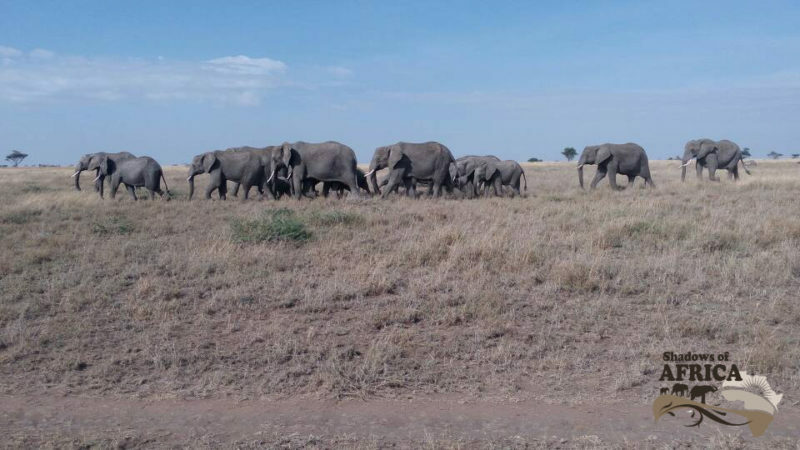 Reports from recent safaris in Tarangire National Park, we can see the movement elephants in the region. Water is low now, due to the lack of rains in this short rainy season. A lot of the animals are migrating to where there is water still. 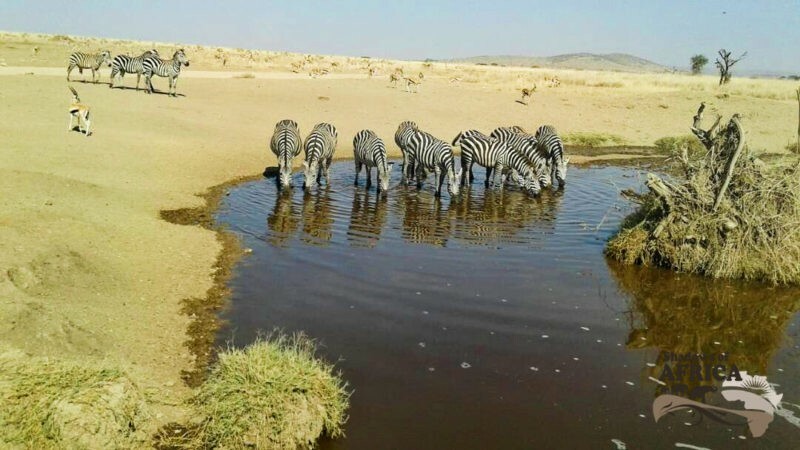 The National Park is still relatively full of wildlife, as the region is protected from villages trying to seek water for their domestic herds of cattle, goats and sheep. The animals migrate in the park according to weather patterns and the access to water. The Tarangire River rarely drys up, so the elephants hang around the extent of the river depending on the vegetation in the area. 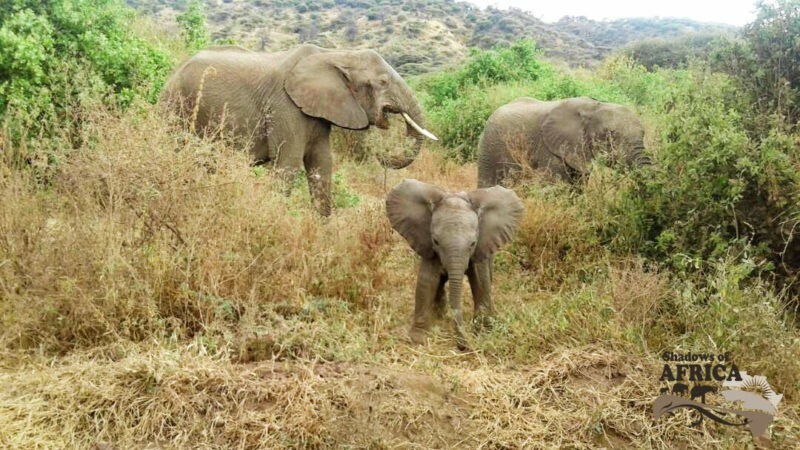 Tarangire National Park is known for its large elephant population. At the moment the herds, are on the move and are covering large areas every day in search of food. Other animals are hanging around the swamp areas where there is more water and vegetation around. At lot of the lodges have pumped waterholes which allow for animals to stay in the areas but this is dependent on the vegetation in the area. From our pictures you can see that the elephants are moving in big herds relying on each other for protection and food. The lodges are getting fantastic views of elephants, zebra, waterbuck, the odd wildebeest and a plethora of birds. It is without a doubt that you will wake up to sound of birds and a view of animals close by. You may even get an elephant close to your room in the night! 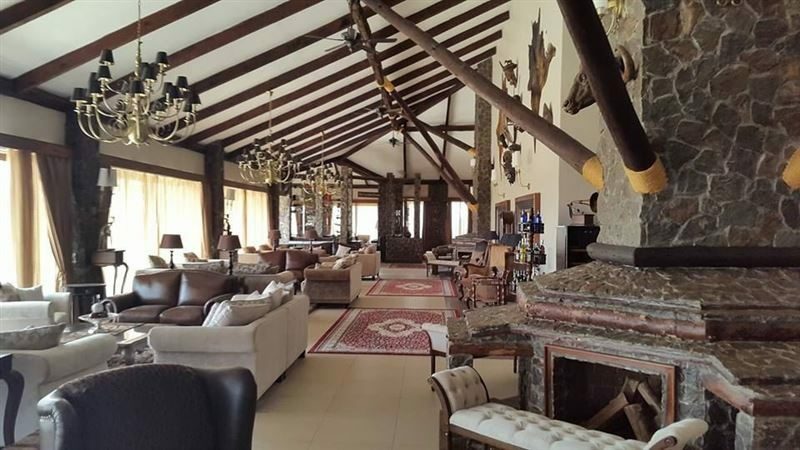 Tarangire Safari Lodge, Sopa Lodge and Oliver’s Camp are excellent examples of lodges with this atmosphere around them. The WMA’s (wildlife management areas) next to the park have it pretty rough at the moment where domestic animals and the wild ones fight for vegetation and access to water. The areas close to the lodges in the WMA’s are a safe haven for wildlife and having waterholes close by they tend to stay. Nimali and Tarangire Treetops are prime examples of such places. Our guests recently have had the pleasure of seeing vast amounts of elephants and a range of other animals. Some were lucky enough to see lion, and a few other predators like hyena. This time of year the wildebeest and zebra are still here in a reasonable number, as later in the year they migrate for the calving season in February. I mentioned birds earlier, now let me explain them a little more. 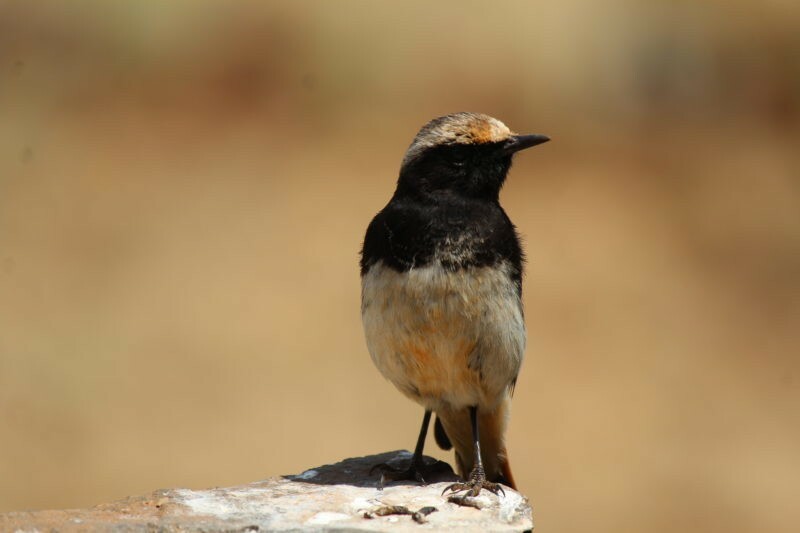 The amount of bird species in East Africa is huge, with many sub species. So for the avid birder reading here, you will immensely enjoy being in Tarangire, you just may fill up your SD card with birds! The beauty is that you don’t have to look hard, they are everywhere! Some birds you may get tired of seeing but there are certainly others that you won’t get the opportunity of seeing again! If you are counting you will be adding up your list pretty fast here. Keep on watching our blog and we will with delight bring you updates and news from places and events in East and Southern Africa. 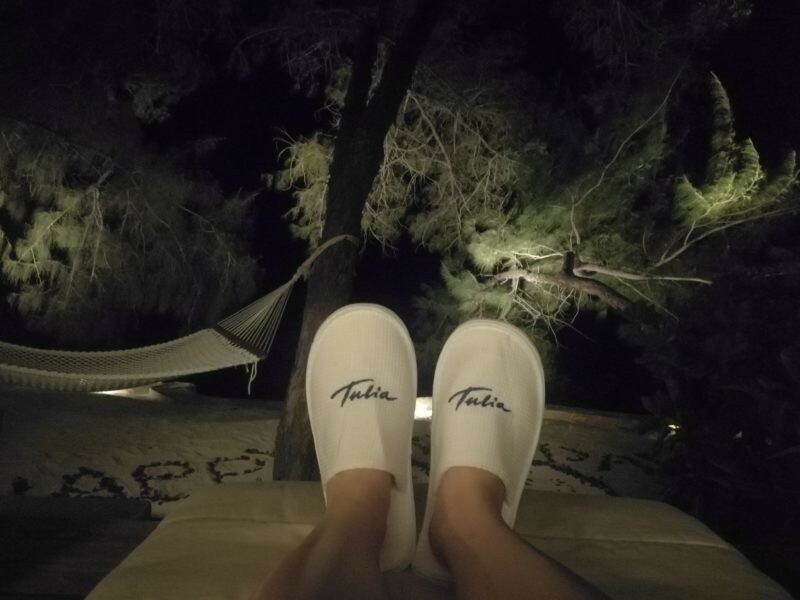 Why do we think Tulia Unique Beach Resort is so special? 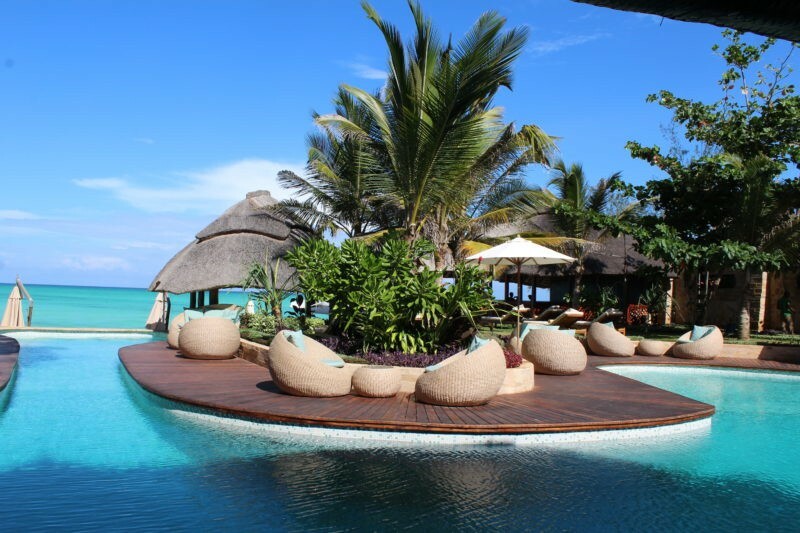 Tulia Unique Beach Resort is located on one of the most picturesque coasts of the Zanzibar archipelago, Pongwe Beach. 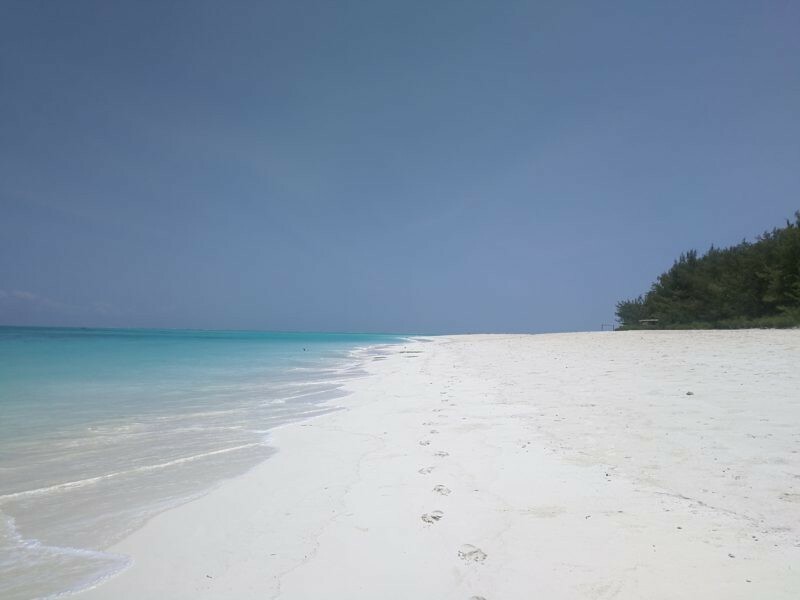 Pongwe is famous for its white sands and crystal-clear turquoise waters. 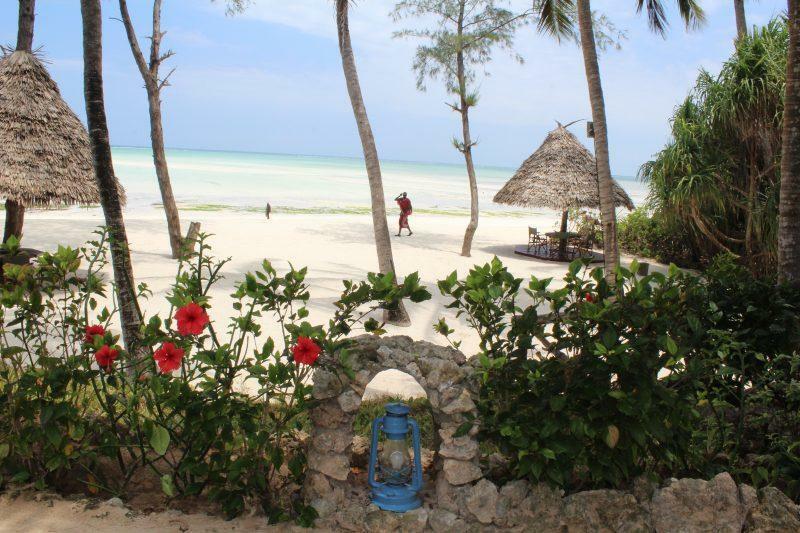 In addition to its natural beauty, it is also one of the most peaceful areas of Unguja, the biggest island of Zanzibar. You will not find crowds of people walking along the coast here, so you will be able to enjoy your rest and privacy in full. What we cannot miss when describing Tulia is the beautiful, modern African design of both its interior and exterior. 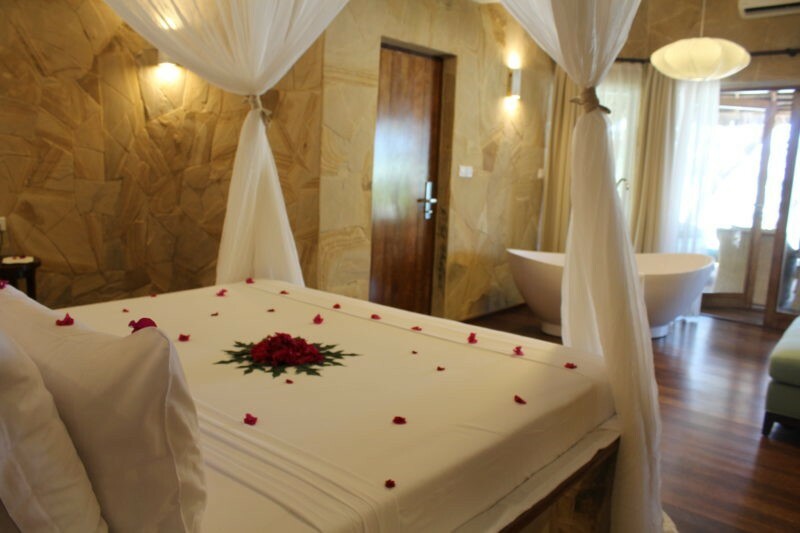 It has sixteen beautiful spacious rooms with huge beds and bathtubs. Its style connects traditional African motifs with modern facilities. Each of the resorts oceanfront villas has its own spectacular Indian Ocean view from atop ocean cliffs. 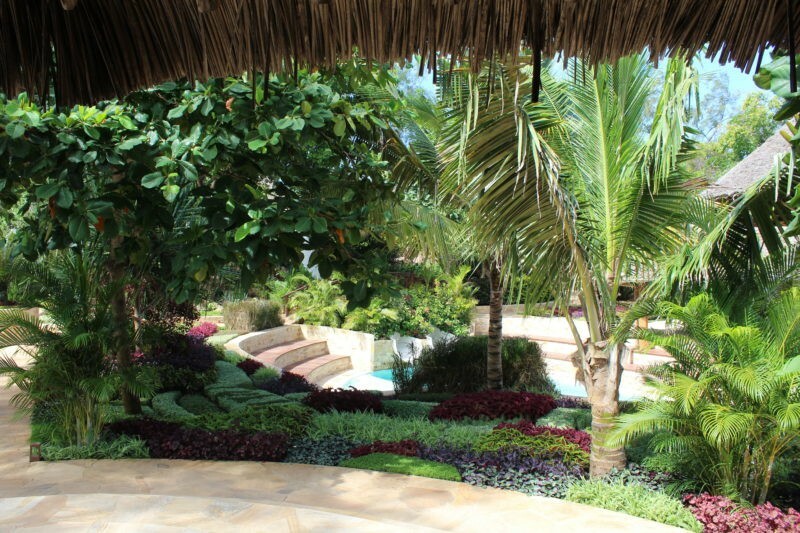 The remaining villas are surrounded by tropical gardens with more than 400 different local plants. Tulia offers guests an à la carte, all-inclusive dining experience, which means you get to select each of your meals in advance. 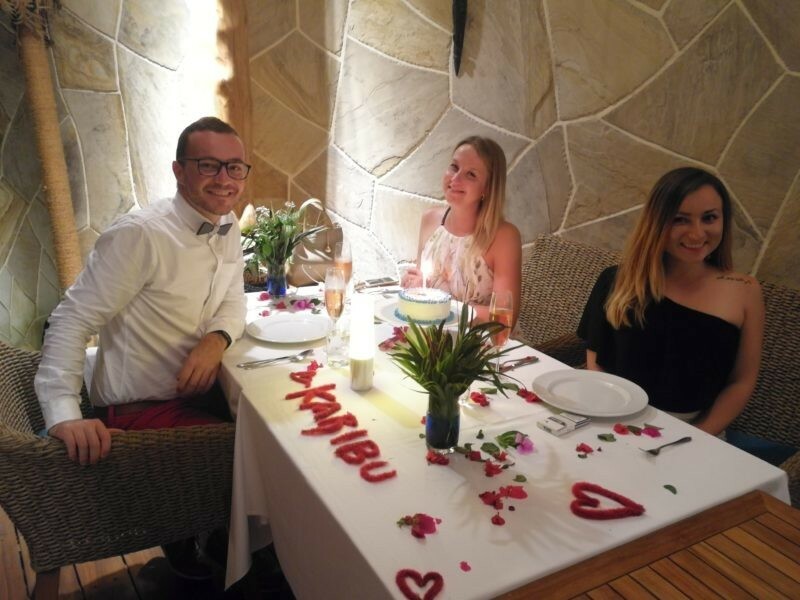 This means thatyou will get everything you like carefully prepared by the hotel’s chef. The menu is mostly international cuisine with traditional flavours added by locally sourced ingredients and spices. Your all-inclusive package offers you both local and international beers, wines, and spirits excepting some elite alcohol. Our Shadows of Africa team can confirm that food in Tulia is delicious. A lot of hotels can boast having their own pool, but Tulia’s pool looks like a piece of art. It blends beauty, design, and that all-important relaxing atmosphere flawlessly. The pool feels as if it is a part of the hotel’s luscious tropical garden, which gives you a feeling as if you are swimming in an exotic lagoon rather than a manmade pool. 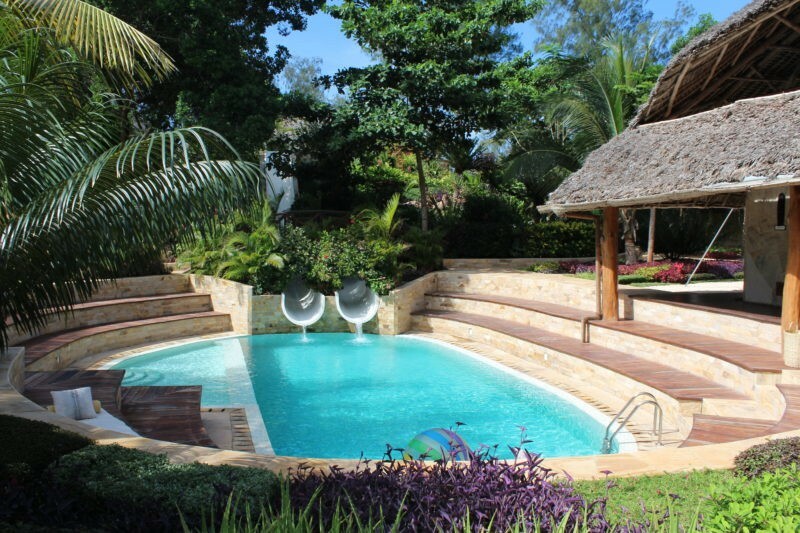 For the young and the young at heart, Tulia is also the only resort on Zanzibar with its own waterslides. It is nice to stay in a luxurious and well-designed villa with nice and inspired decor. 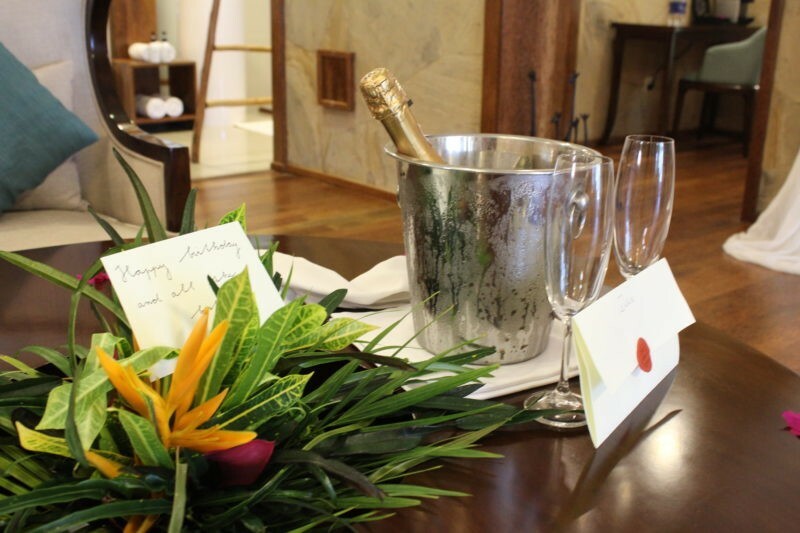 Our team recently visited and had the opportunity to stay in one of the oceanfront villas.They were more than happy to enter the room fully decorated with flowers for the special birthday occasion. 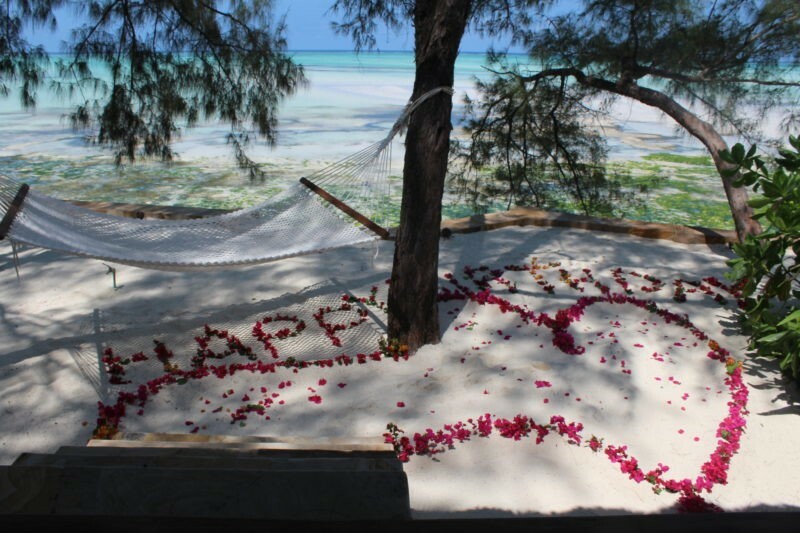 The “Happy Birthday” sign was written with flowers on the sand beside the villa’s terrace. Even small details in the room were embellished with colorful fresh flowers. You cannot feel comfortable at the hotel if you do not feel sincerely welcomed there. When it’s about Tulia, you will enjoy your stay from the first step. Everyone is greeting and smiling at you. Upon arrival, you will be met by the management to agree all your preferences and requirements. The general manager of the resort, Lukas Sinogl will personally check if your stay is pleasant. Tulia is a unique place where you will get luxury treatment, but will feel like you’re at home. Behind great reviews there is always a lot of work. To get service perfection, Tulia takes care of clients with a great level of attention. You will not leave the dining table if you are not full or delighted, the barmen will take care of preparing your favorite drinks, and housekeeping will keep your villa clean and tidy. Once you arrive, your complimentary bottle of wine will await you in your room and your free massage included to the package will be arranged at your earliest convenience. If you don’t like to stay on the beach or near the pool all the time, you can add some activities to your time at Tulia. The resort offers free bike hire, as well as complimentary snorkeling and kayaking equipment. Other watersports activities can be arranged on request. To make your time even more relaxing, you can visit the spa for massage and beauty treatments. Everything in Tulia is carefully designed to ensure that you have a good rest. 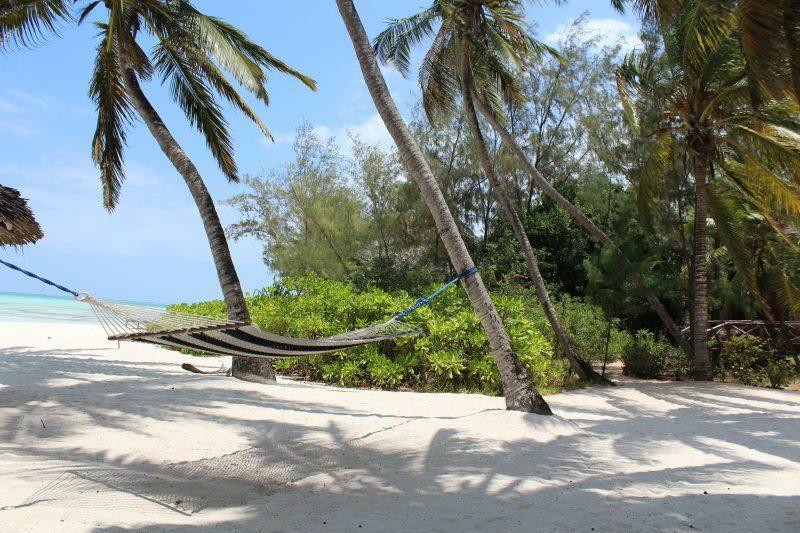 Even the word “tulia” in Swahili means “to relax”. Its picturesque and colorful garden with tropical birds will definitely become one of your favorite spots on the island! But “relaxing” doesn’t have to mean “boring”. The hotel occasionally invites local bands to perform during dinner to lend the resort a more vibrant atmosphere. On Fridays, you can even ask to arrange a transfer to local festivities. Tulia can offer the perfect experience for any taste. Not big, not pompous, but elegant and comfortable, Tulia will leave you with an aftertaste of perfection. 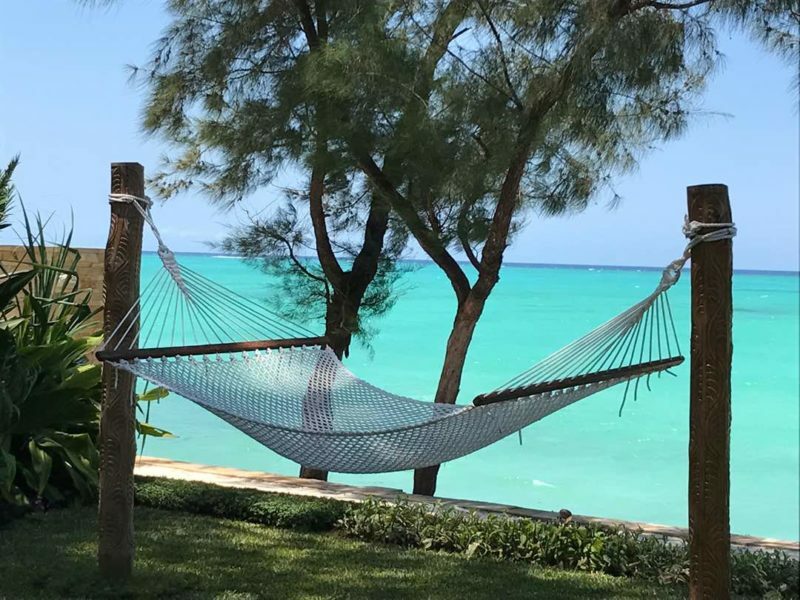 You will remember the great customized service, beauty, and smiles all around, all set against the backdrop of Zanzibar’s stunning natural beauty. It is a great option for honeymooners, families, and good friends. Our team will not hesitate to recommend it for you! 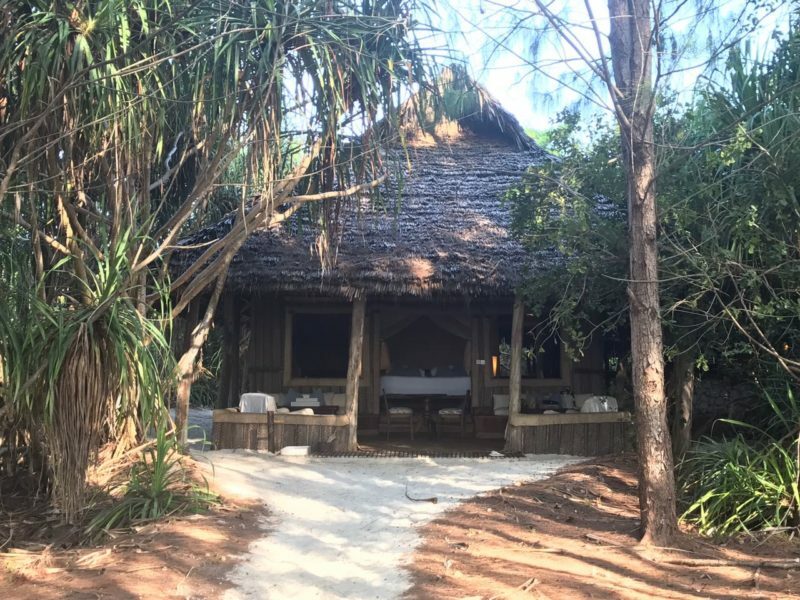 andBeyond Mnemba island is a private island paradise considered to be one of the most unique, luxurious and expensive hotel you can find on the Zanzibar archipelago. 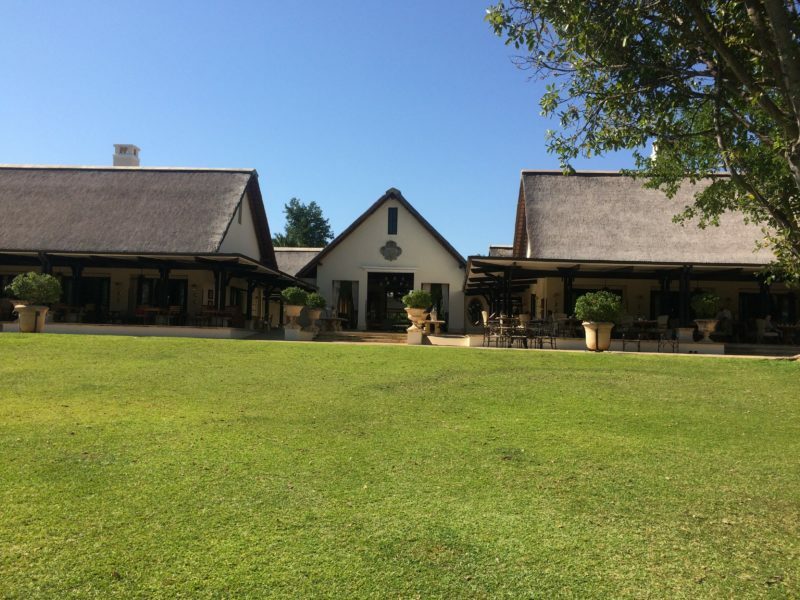 Intrigued, the Shadows of Africa team was wondering whether the property lives up to its hype and its hefty price tag and decided to check it out for themselves. Julia and Lesia from our Ukrainian office had a short stay in the lodge and were blown away by their experience. andBeyond Mnemba Island is a private island located not far from Unguja, the largest island of Zanzibar. It takes around twenty minutes to get to Mnemba by boat from Muyuni Beach. 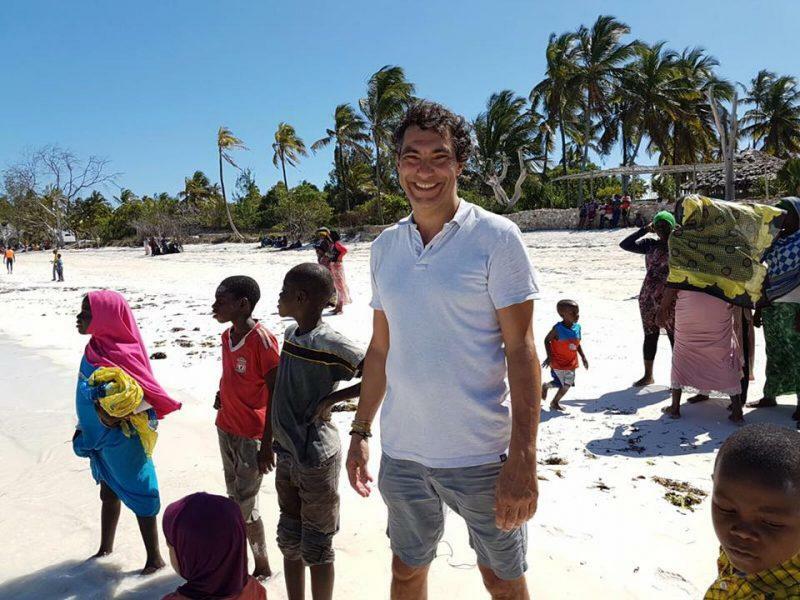 During the trip you will enjoy the view of Mnemba, traditional dhow boats and the crystal clear waters of the Indian Ocean. The resort is an exclusive one and you’reonly allowed to set foot on the island only if you have booked a room in the resort. When the ladies arrived on Mnemba, they were met by the management and got a short briefing regarding their stay. The chef came out to greet them and to double-check all their dietary preferences. After welcome drinks, they were escorted to their luxurious room. 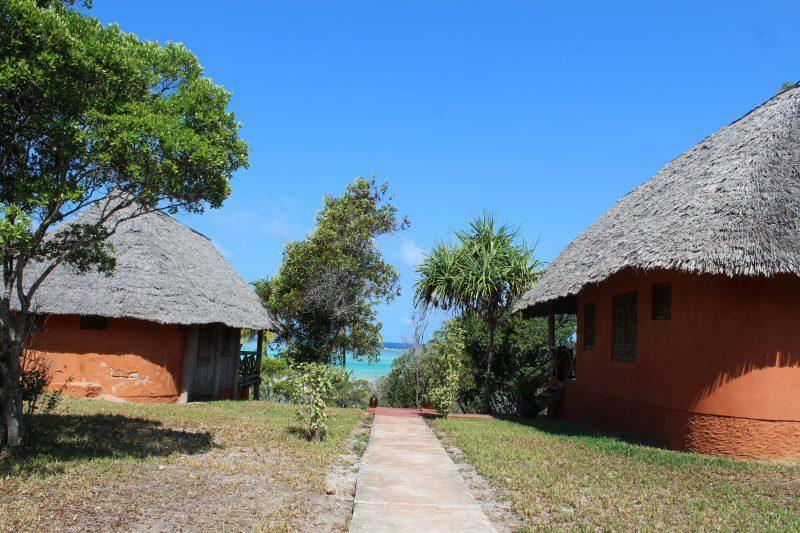 AndBeyond Mnemba Island Lodge has ten beachfront bandas with no windows or doors. This gives guests a truly exclusive feel to their vacation, with approximately 20 guests can stay on the island at any onetime. Each of the bandas sit apart from one another, promising you maximum privacy. 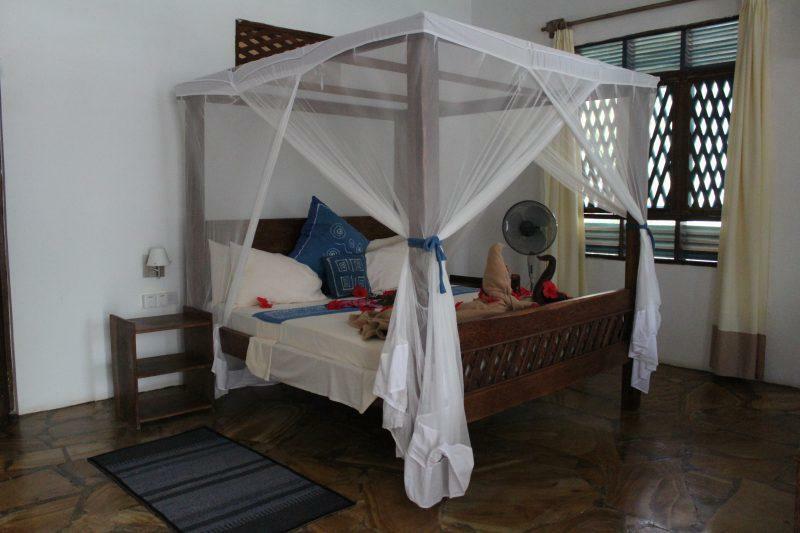 Each of the bandas is surrounded by tropical forest and has a spacious veranda with easy access to the pristine beach. 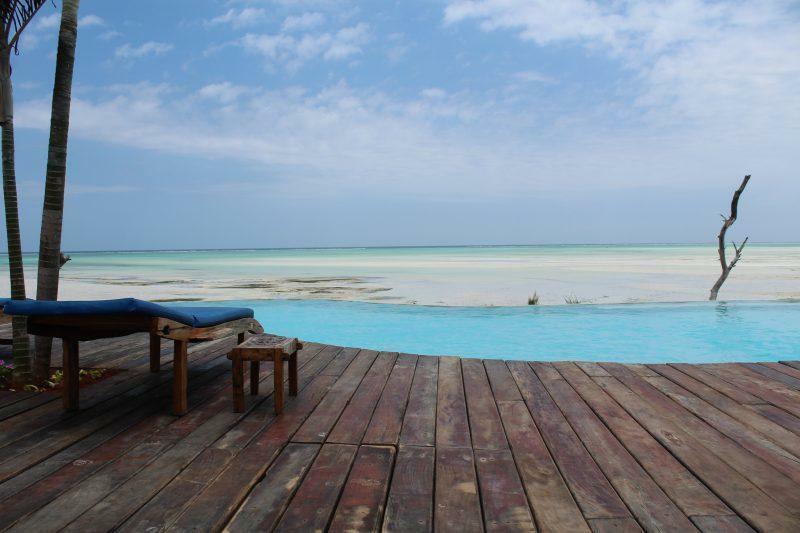 Guests get their own lounge zone and traditional Zanzibari sunbeds. A covered walkway will bring you to a shuttered bathroom with a huge shower. Basically, in the bandas you will find everything that you would expect to find in a luxuryhotel, all while maintaining that feeling of connection with nature. Julia and Lesia felt that they got a truly decadent Robinson Crusoe experience. The chef took care of a tasty lunch with a choice of different starters and main courses. The food was so good that the ladies even broke their rule and ordered dessert. The sorbet with cardamom and pineapple looked too attractive to refuse! If you have any special dietary requirements, the hotel will take care of it in advance. 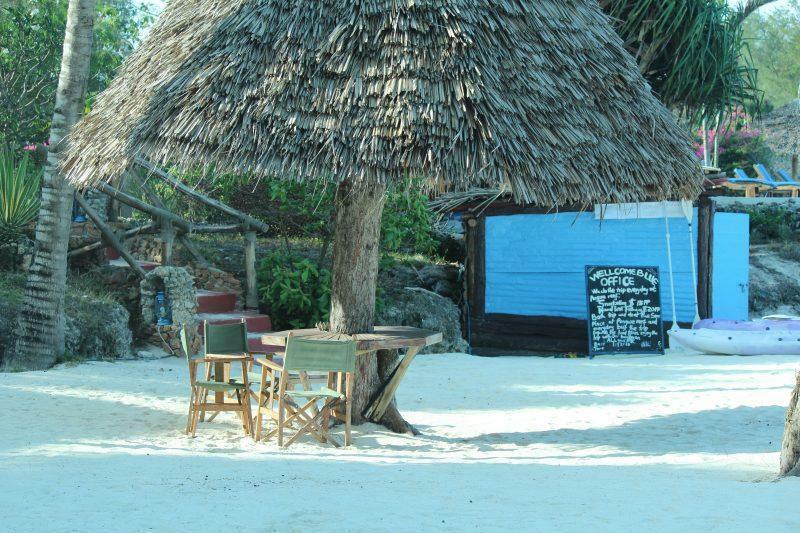 Dinner in Mnemba is usually served on the beach. You will get a beautiful set up surrounded with lights. You’llbe served by your own butler. After a delicious meal,the staff of the hotel did a birthday surprise for Lesia - a beautiful cake decorated with fruits and candy! 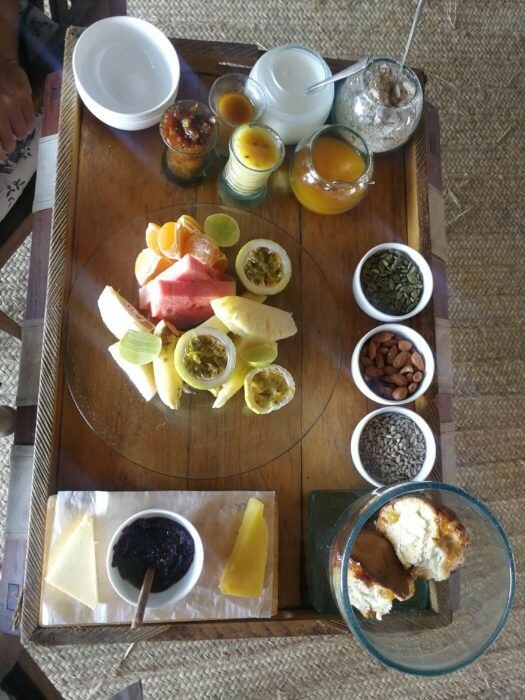 Breakfast on the island is served with a variety of fruits, seeds, and natural jams.The chef and your butler will follow all your preferences. The guests dine in the main restaurant admiring the view of the ocean. Though, you can always request it be served in your villa and enjoy some privacy. Sleeping in Mnemba is a very unique experience. Your bed faces the ocean and the absence of a door lets the gentle crash of the waves lull you to sleep. You’ll rest safe and sound beneath a mosquito net in your huge, comfortable bed and wake to the sound of birds singing their dawn greetings. In the morning, the ladies decided to explore the island. 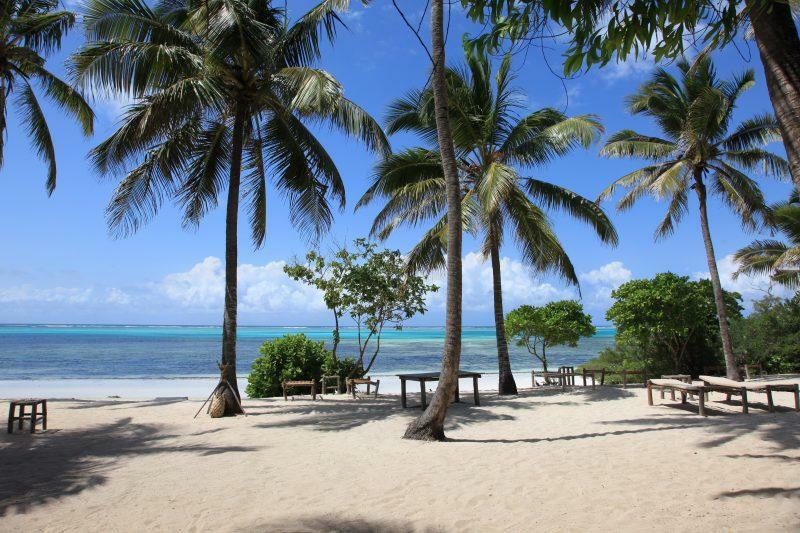 Mnemba Island is surrounded by a coral atoll which has been declared as a Marine Conservation area. It is a great spot for divers and snorkelers.. As it’s a house reef, you don’t even need a boat! Just walk into the water and explore the marine life. If you have a PADI certification two dives per day are even included in the package! You can also go kayaking, wind-surfing or go for a sunset dhow-cruise. There are three dolphin species around the island, whale sharks, and around 600 species of coral reef fish. If you are lucky, you might even spot humpback whales! The beach of the island is also a nesting place for Green Sea Turtles, which you can see from February to September. Besides the stunning beach, the island can boast a tropical forest with some rare antelope and bird species. Here you can meet the suni antelope and even the highly endangered Ader’s duiker. Julia and Lesia experienced privacy in full in Mnemba. Guests of the island might meet each other sometimes during lunch or walking around the beach, but you will definitely get a feeling this island is just for you! 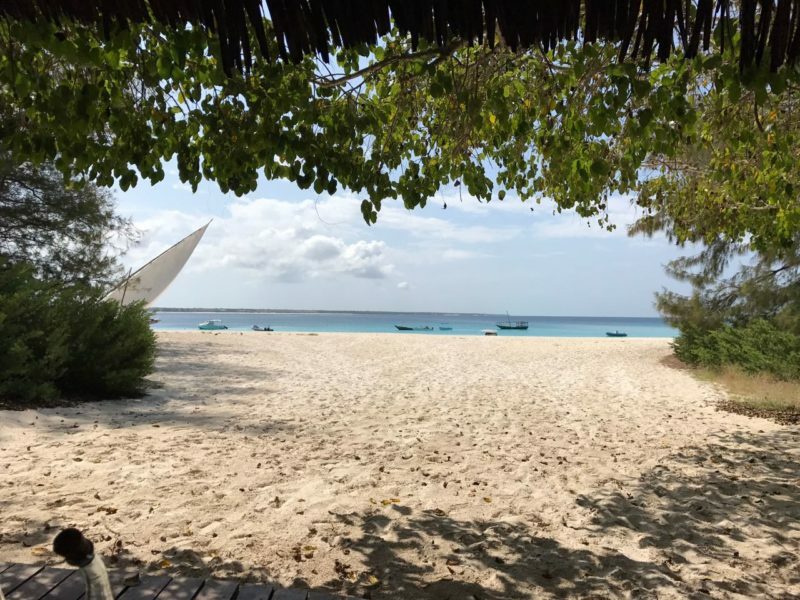 andBeyond Mnemba Island is not a place for party people, who like to interact with other guests, enjoy shows, and participate in extreme activities. 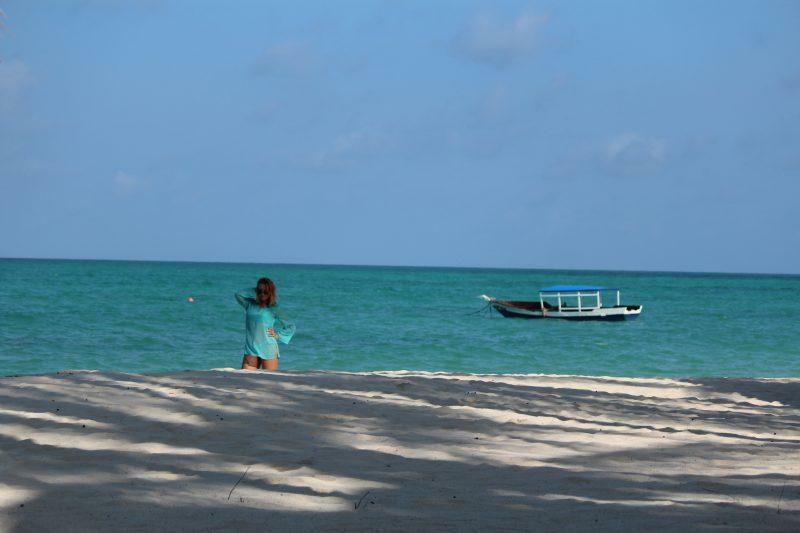 It is perfect for that travelers who would like to get some relaxation and time for themselves, who wants to forget about the work and their problems, connect with a nature and enjoy one of the most beautiful beaches in the world. It is also for that once who appreciates great service and barefoot luxury experience. 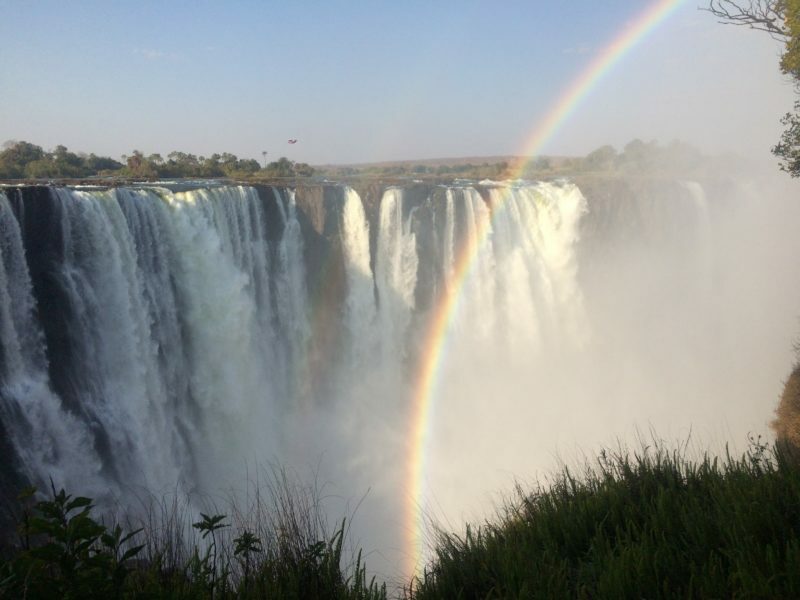 Recently, some of our team had the pleasure of exploring Zimbabwe and its great sights and National parks. Present was Jake and Stacy from the USA office and Bryan from the Zimbabwean office. Exploring a country like this is truly a delight that must be on one's bucket list. 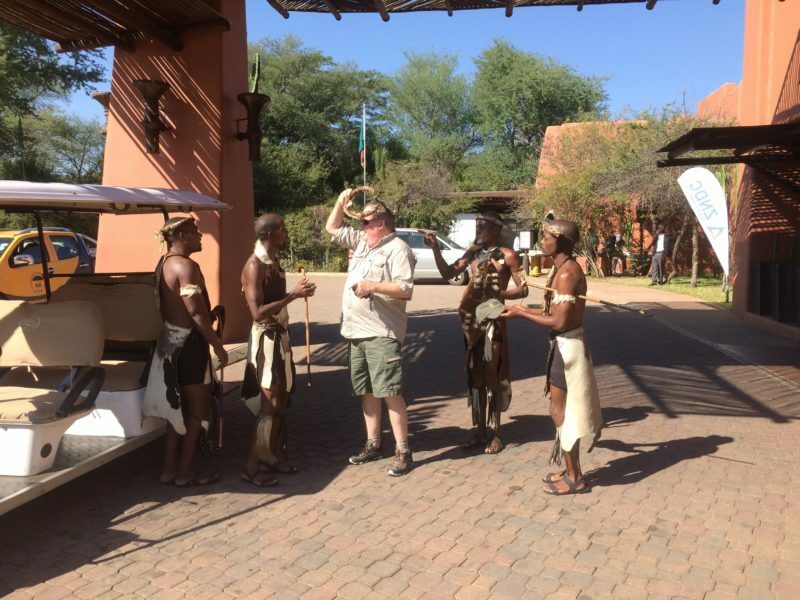 Arriving at the new Victoria Falls International Airport was a welcoming moment, as you walk out men dressed in traditional animal cloth, sung welcoming songs for us in Shona and Indebele. It takes roughly 20 mins from the airport to the town, Victoria Falls, itself. The town is quaint, much smaller than you would imagine. Victoria Falls is the tourism hub of Zimbabwe, the majority of the people visiting here will pass through this little town. Now on this particular visit, we crossed the border and stayed at two hotels on the Zambian side, the Avani Hotel and the Royal Livingstone. 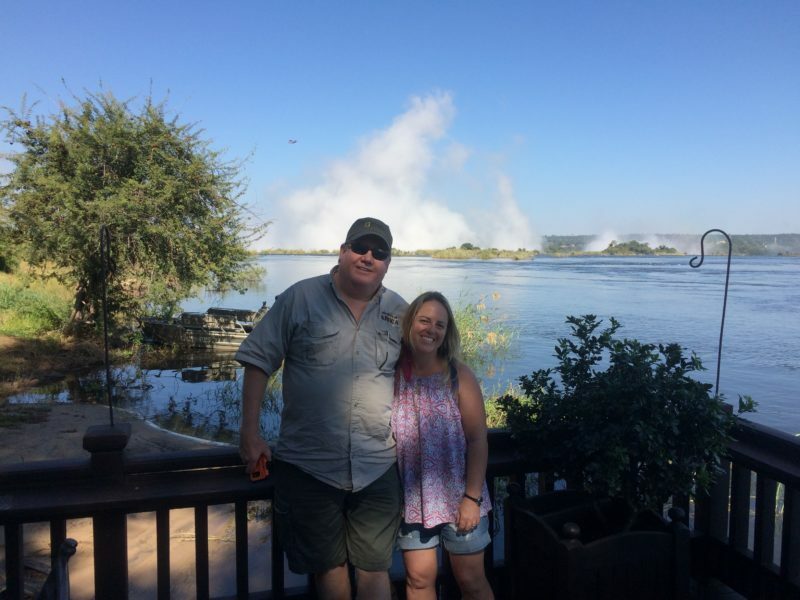 Crossing the border these days as a tourist has become one of the easiest things possible, mainly due to the existence of the Kaza Visa – a visa that allows for unhindered travel between Zimbabwe and Zambia. A detailed blog post will follow explaining all the details regarding this visa. Over the next few days, they travelled frequently across the border without any hassle. 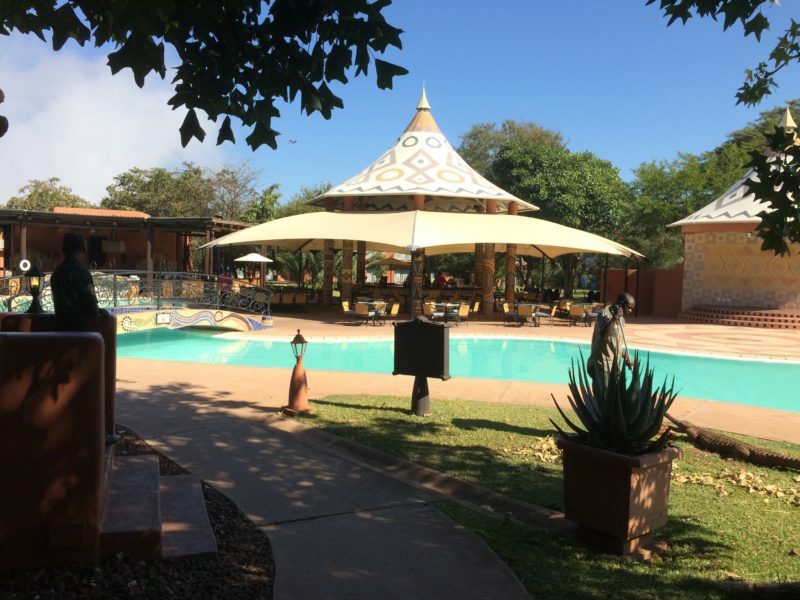 The Avani Hotel and the Royal Livingstone though owned by the same company are very different and cater for very different people. From medium to super luxury you certainly will get catered for with comfort! These two great hotels are located along the Zambezi River, you can have sundowners right on the edge whilst watching the sunset in the mist of Victoria Falls! It takes just a few minutes walk before you are at the edge of the falls, we highly recommend the walk early in the morning as you will get to see the sunrise over the falls! You will definitely tick off some of your greatest memories ever made! Further up the River, there is Thorntree Lodge, a medium to luxury lodge, that will blow away your mind. It is also located right along the river so you can sit in your room or private pool and admire the river life right before you. 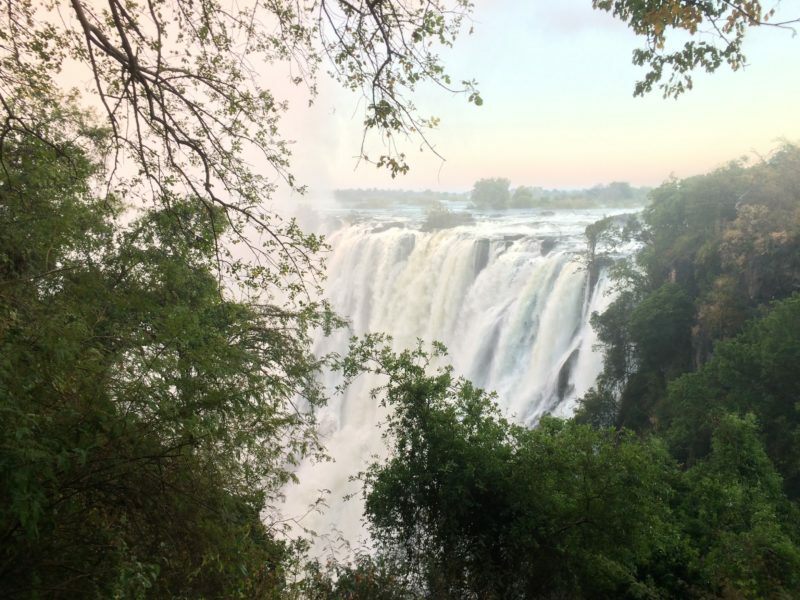 Bryan had previously been to Victoria Falls in 2016, and his excursions there will tell you that this is the adrenaline capital of Africa! The activities here are rated in the top 5 in the world, you will not leave disappointed. 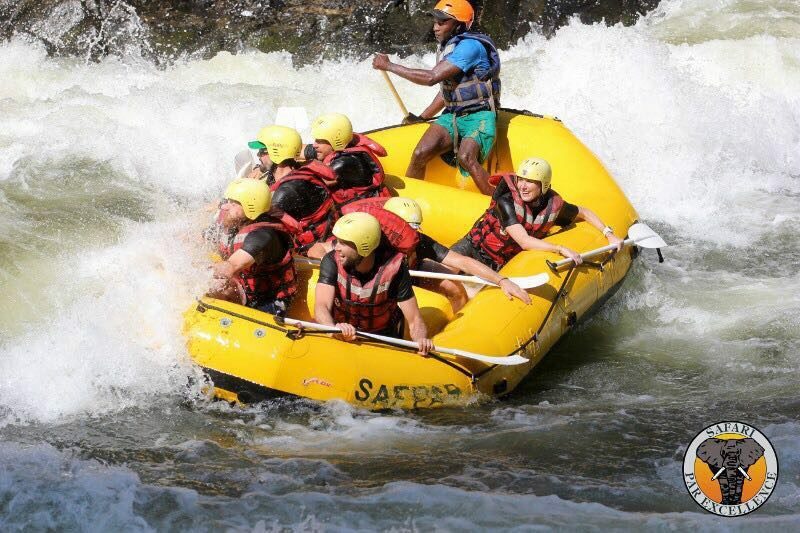 From bungee jumping and gorge swinging above the Zambezi, white-water rafting on the Zambezi to the flight of angels above the falls; you cannot go wrong coming here. 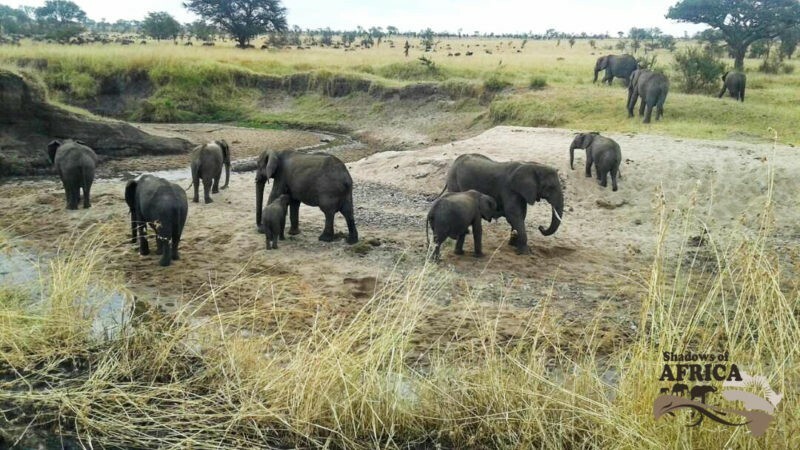 Other activities like the lion encounter, games drives in Zambezi National Park, boma dinners, the devil’s pool, sunset cruises and dinners, the elephant encounter, will keep you occupied from dawn till dusk every day that you are here. 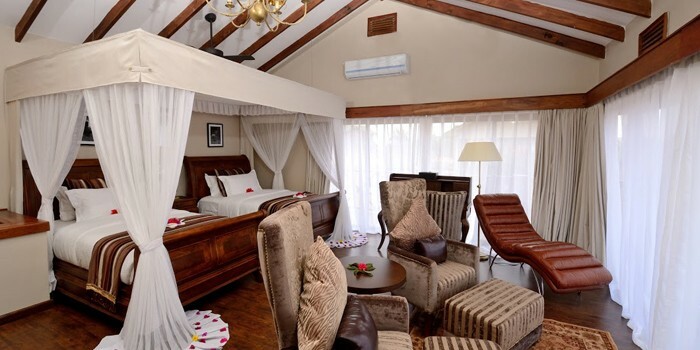 Great hotels and lodges on the Zimbabwean side like the Explorers Village, The Victoria Falls Hotel, Vic Falls River Lodge, Vic Falls Safari Lodge, and many others will keep you satisfied during your stay in this great little town. Watch our website for information about all these activities and accommodations in this region, email us if you have any questions. 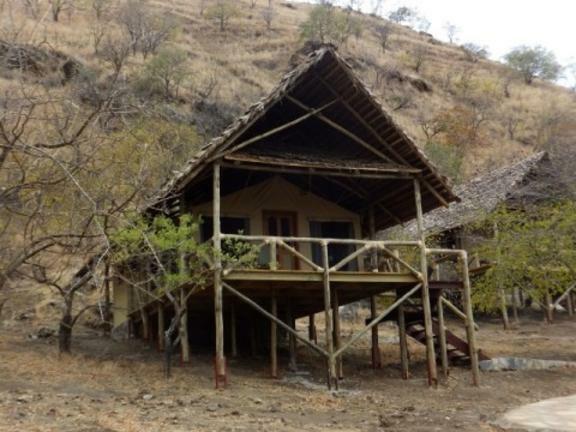 This past weekend, a few members of the Shadows of Africa team visited Oldeani Mountain Lodge just outside Karutu! This is located near Ngorongoro Crater. Rated as one of the most luxurious lodges in the region, it is truly a splendid lodge to stay at whilst exploring this breathtaking area. If you want a place where you can relax and freshen up in comfort, this is definitely the place to come to. The team arrived just before lunch after a 2-hour drive from Arusha. 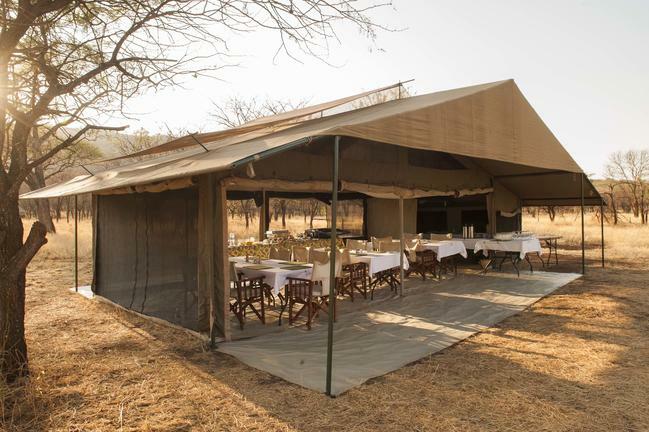 Once inside the gates, you can truly feel that you step out of the bush into luxury comfort! The greetings by the staff and the Maasai women were warm and welcoming! The design is modern African with a western touch. 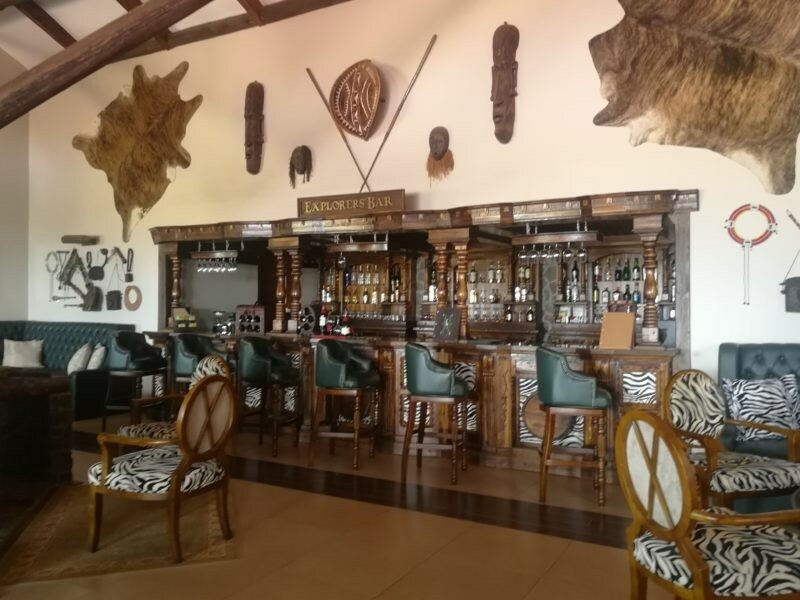 When one walks inside, you cannot help but let your eyes wander at the pictures and the ornaments displayed – most are of local African design or of wildlife from the area. 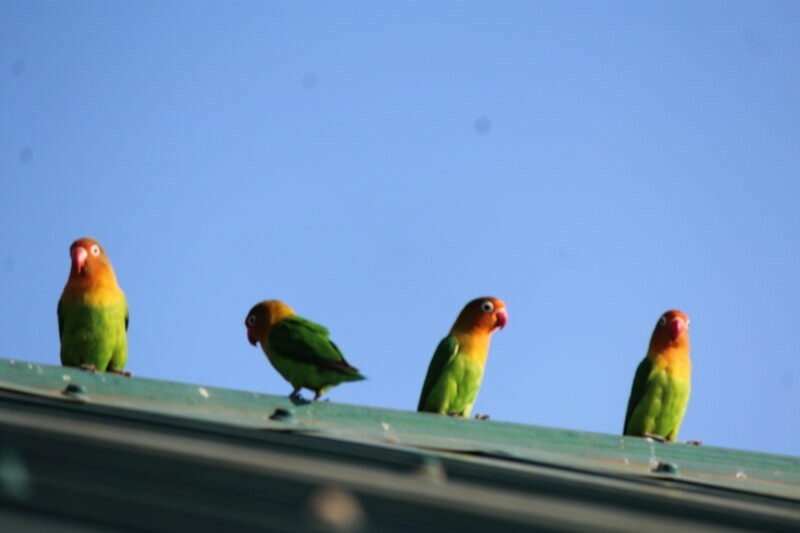 The air is filled with sounds of birds, the most common being the Fisher Love Bird, they add to the atmosphere of the place. 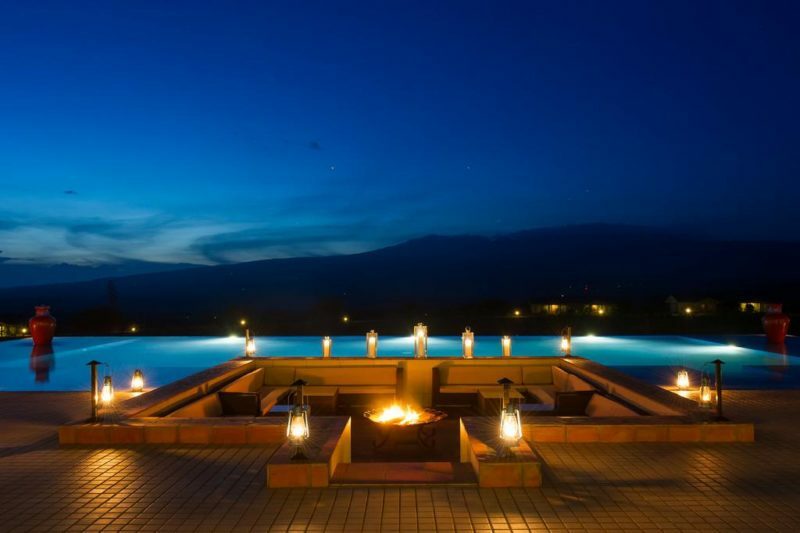 As you walk out onto the veranda the infinity pool extends out and you can see Oldeani right in front of you! The rooms are beautiful and whether you are in a suite or a twin, you can certainly be treated to all the delights of the luxury hotel. Those that want to get in touch with nature can shower outside – privacy though is guaranteed. The beds are soft and comfortable, air conditioning is available for those that want it, The hot water is hot and there is lots of it! In the mornings you can open the sliding doors and allow the sunshine and fresh morning air to flood the room. After being in a safari truck all day, this is exactly what you need! Relax, this place also has an upcoming spa where you can take it one level further in achieving a relaxed state. Inside the main area, there is the lounge and bar! The lounge is supplied with great board games to amuse children and adults alike. A billiards room is located on the on the corner to entertain the more active person. Don’t worry the bar has you covered, and drink they can conjure up for you by a there plentiful array of alcoholic beverages. The food served here is tantalizing, the team was certainly happy with all the choices on the menu. The chef is definitely really good, you will be filled up in a healthy way. Those that want to maintain a healthy lifestyle you may go to the gym are relieve your body of those extra calories gained whilst on safari. A children’s club is located on the ground floor where they can amuse themselves for hours, with a movie theatre right next to it as well. People travelling on a more serious note can have board meetings etc in the boardroom located within the main building. I can say this place is a great location for a company retreat, and team building retreat! Sometimes you understand that you like a hotel by the style of its rooms, the nice location,or the quality of its service,but sometimes you just come to a hotel and get the feeling you don’t want to leave. 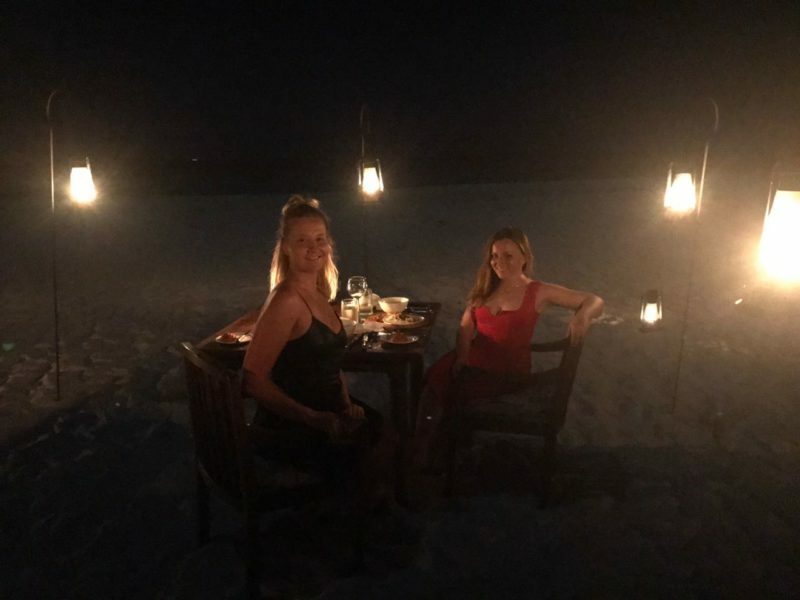 This happened to Lesia and Julia at the Pongwe Beach Hotel in Zanzibar. 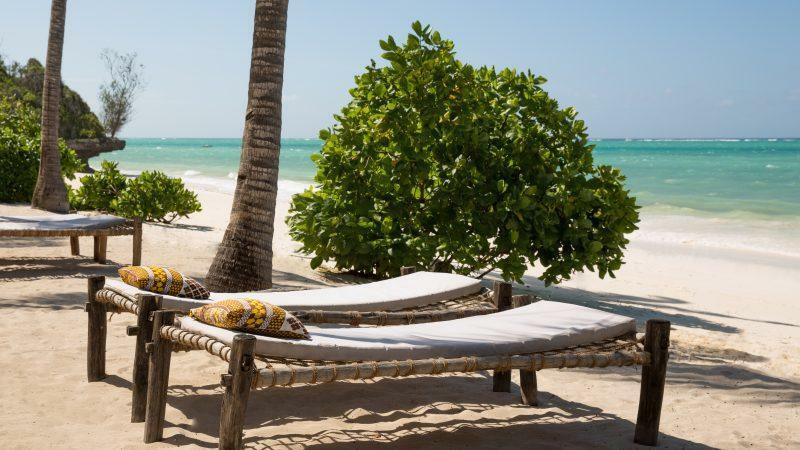 Located in the one of the most picturesque parts of the island paradise, the resort can boast its own quiet beach, eco-friendly villas, and amazing food. You will have a break from the real world in your room with no TV or Internet, so you will forget all troubles and just enjoy. However, you can still use Wi Fi in the public areas of the hotel. Don’t worry! 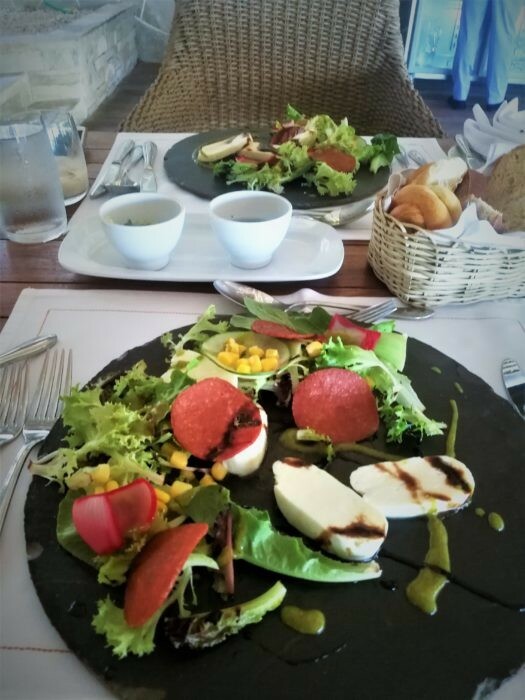 Lesia and Julia experienced a lunch in Pongwe and it was delicious. 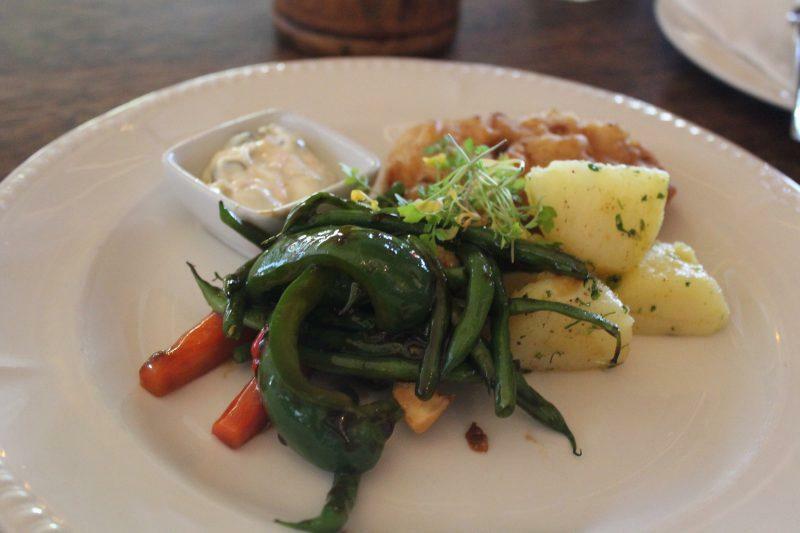 They were treated with tomato soup, fresh Dorado with some vegetables, and ice-cream for dessert. Later, when the tide was high enough, the girls decided to check out the beach. The water was so clear that you could imagine yourself being in a beautiful lagoon. 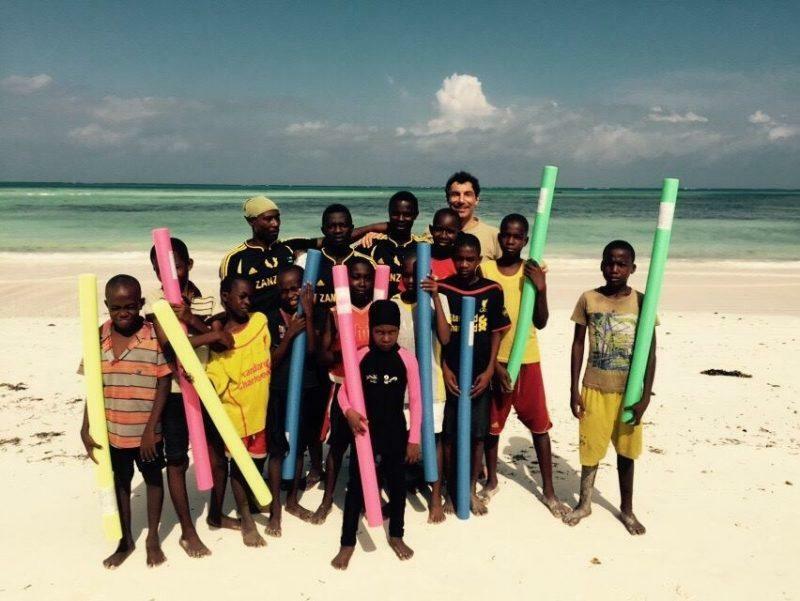 That was one of their favorite beach experiences in Zanzibar. While you sunbathe or frolic on the shore, the staff from the hotel is treating you with fresh fruits. When the tide is low, you can still swim in the hotel’s pool and enjoy the view. The Pongwe Beach Hotel is perfect for those who want real relaxation far from hustle and bustle. 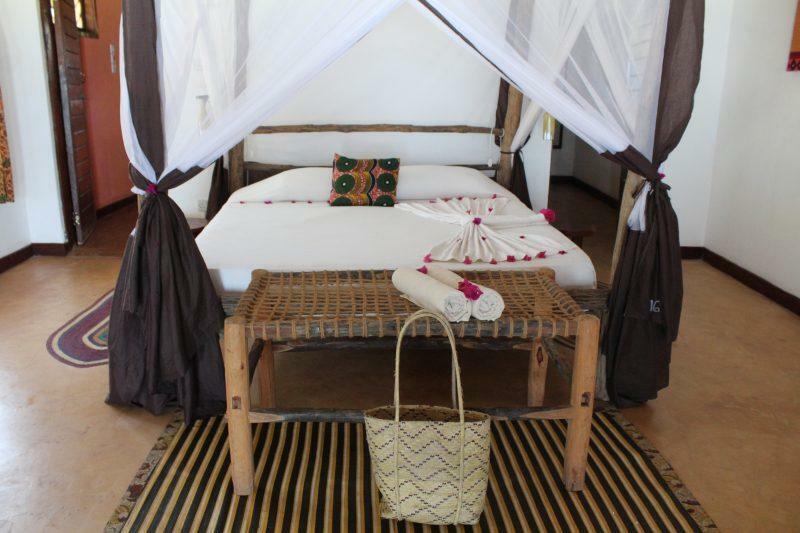 A romantic Zanzibari escape, picturesque beach, tasty food, stylish bungalows – all is waiting for you in Kichanga Lodge. Kichanga is a little bit wild but it has such good style and taste. Once you enter the lodge – you’re greeted by an atmosphere of complete relaxation. We are sure that the first secret to its amazing atmosphere is hidden in the staff working in Kichanga. We were treated to amazing hospitality while staying with Kichanga and felt absolutely at home. The people are so warm hearted and sincerely happy to welcome you and do everything possible to make you feel special and comfortable. They have a personal touch with every each client. We had a chance to meet the owner of the lodge personally. 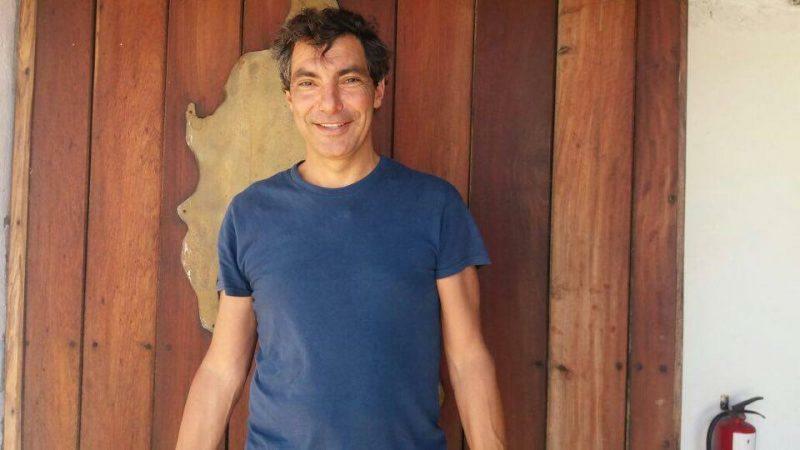 Nigel Firman is a British- Italian guy who has spent 12 years of his life on Zanzibar. He came to South- Eastern part of the island to open Kichanga while it was completely wild land without roads, fresh water,or electricity. Years of experience have made this place like a slice of paradise. Another very important thing to note is that Nigel and the management of Kichanga have a charity project for the local community. The idea of the project is to help local people to learn how to swim. It’s not all about business at Kichanga, it’s also about taking good care of people. 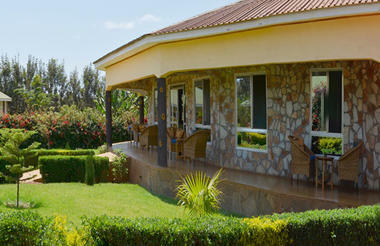 The property’s 23 bungalows & villas are perfect for those who love nature and appreciate privacy. 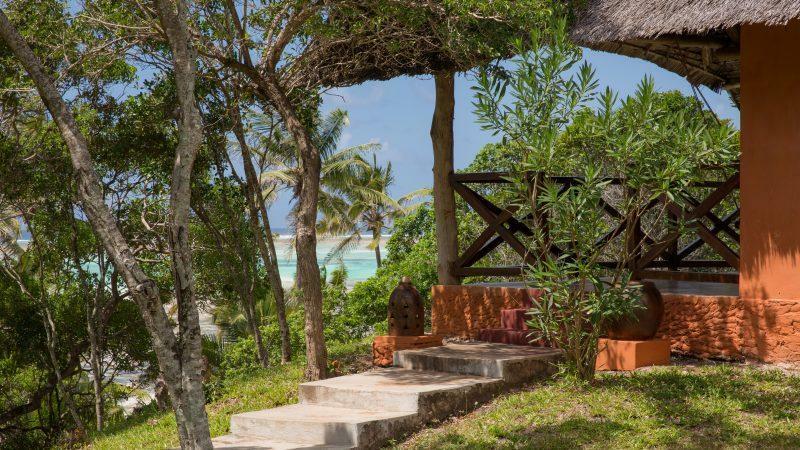 Kichanga Lodge enjoys a prime location surrounded by tropical gardens, a picturesque white beach, and the crystal clear Indian Ocean. 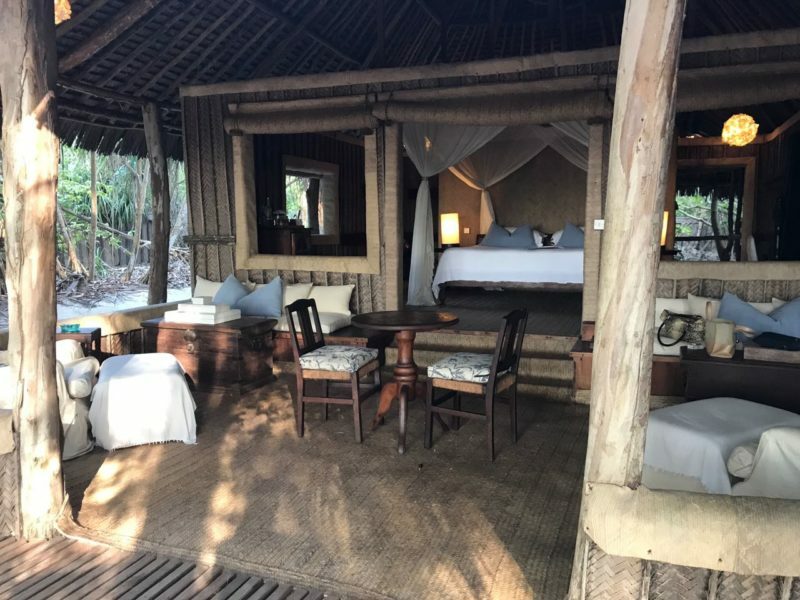 Guests will find the bungalows to be very spacious and comfortable, with a private hammock on the veranda where you can stay and admire the sunset over the ocean. 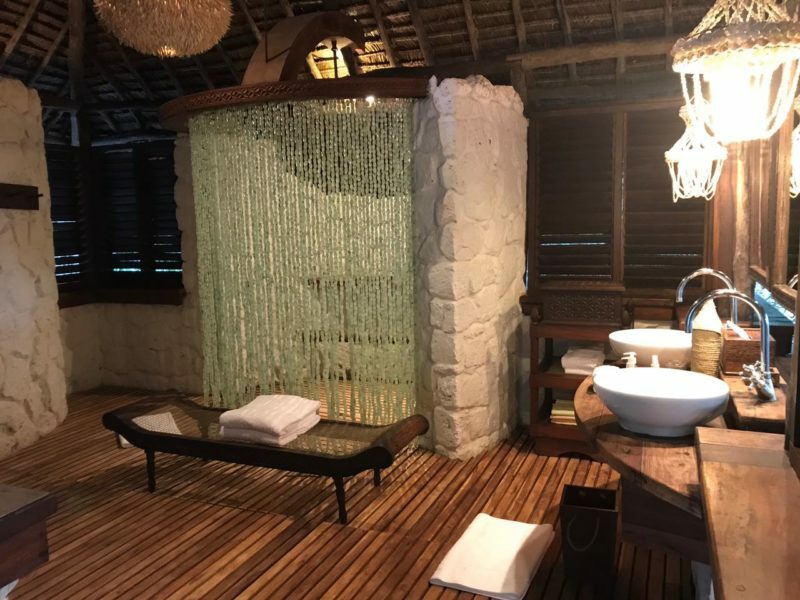 Inside of each bungalow there is natural air conditioning – the absence of windows allows the ocean’s breath to refresh the air and cool you off. Additionally,every room has nice beach amenities such as a beach bag and towels. Kichanga is a great place to clear your mind and to forget about the whole world.